NFYFC has released a new report that evaluates the impact of the community support given by Young Farmers’ Clubs during its Countryside Challenge project. The Countryside Challenge, with funding from the Cabinet Office and Pears Foundation, supported five community projects per quarter over two years. YFCs could earn up to £400 to put towards their community and environmental project and NFYFC also offered tools, resources and training to clubs. A total of 546 young people took part in projects funded through the Countryside Challenge and 36 projects were awarded grants totalling £14,400. Dorrington YFC is one of the case studies included in the report as the club restored and resurfaced a play park – helping it to become a valued community facility. The report also shows the positive perceptions of YFC following the completion of a community project. It demonstrates that social action projects provided YFC with a valuable platform to showcase not only their capabilities to deliver high quality projects but also the important contribution they make to wider society. Lynsey Martin, NFYFC's Chair of Council, said: "This report helps to show the true impact of the Countryside Challenge project and what YFCs achieved. The evaluation demonstrates how big a difference YFCs can make in their local rural communities and the positive impact it has on the wellbeing of those who take part in supporting their community." 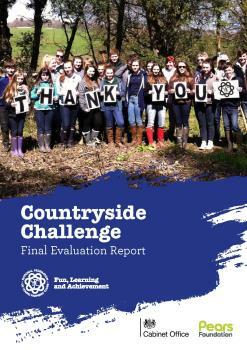 To read the report in full, which was prepared by Impact Consultancy and Research for NFYFC, download it here.